It seems the Beatles were right when they sang all those years ago that “Money can’t buy me love.” Although China’s trade ties with and economic influence on its Asian and Pacific Rim neighbors are greater than ever, that doesn’t automatically translate into warmer feelings toward the People’s Republic among publics in the region. Between 2003 and the first quarter of 2013, the bank concluded, the United States had a stronger influence than China on the six Asian economies where results for both were statistically significant. But from 2008 on, while the United States was either in full-on recession or a weak and patchy recovery, China was more influential. As it happens, among the questions asked in this spring’s Pew Research Center global attitudes survey were a couple about attitudes in different countries toward the United States and China. Overall, the United States enjoyed a more positive global image than China: A median of 63% expressed a favorable opinion of the United States, compared with 50% for China. One might assume that stronger economic ties would engender, or at least correlate with, positive attitudes. But one would be wrong: Five of the 10 countries Standard Chartered examined also were surveyed by Pew Research, and there’s no clear relationship between favorability ratings and the size of the economic footprint. 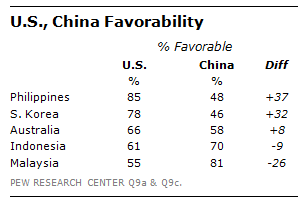 China’s highest favorability rating, 81%, came in Malaysia, a country deemed slightly more exposed to the United States (rated favorably by 55% of Malaysians) than to China. Indonesians, whose economy was deemed to be fairly highly exposed to the United States relative to China, said they liked both countries — 61% rated the United States favorably and 70% did so for China. South Korea was rated as being more exposed to China than the United States, especially in recent years. But Koreans seem to have unsettled, and at best lukewarm, feelings toward their giant neighbor. Only 46% of Koreans said they had a favorable opinion of China, versus half who expressed an unfavorable opinion; 27% said China was more of a partner, 17% said more of an enemy, and 53% said neither.